Extreme Marble Restoration & Polishing Corp specializes in stone polishing. Give us a call today to find out more! Cornerstone Developers & Constructors, inc. Cornerstone began as a dream, a dream to one day create and build in a way we believed to be lacking in the industry. Creating reasonable timelines, and reasonable cost estimates are just the start. We dreamed of calling a construction company and actually being able to reach the builder instead of the assistant's secretary, of being able to send a concerned message at an hour other than 9-5 and actually getting a response. And here at Cornerstone, we are a family owned, family run business, so you can bet that we are doing our absolute best and treating your project as though it were our very own. Your patronage is what fuels not only the company, but our very own families; without you, there is no us. Allow us to make you a part of the Cornerstone Family. 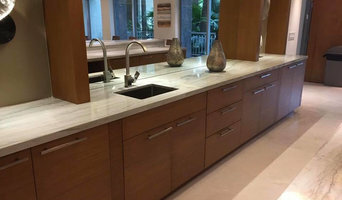 Designing and fabricating custom furniture and cabinetry, fabricating custom furniture and countertops of Dupont Corian. Have been in business in the Miami area for 39 years. Have worked extensively in the So. Fla area and the Bahamas doing custom and production cabinetry and countertops. I am a Dupont certified Fabricator/ installer , with certifications in other solid surfaces also. I am a small shop that believes in a personal relationship with the client. I personally fabricate all my work , with helpers , and do the installs myself also. There are no middlemen. I have worked and still work for some of the elite showrooms and design firms, both locally and out of state.I am licensed and fully insured and have extensive references. available on request. I am competitive in pricing. RENOVA CONTRACTORS’s mission is to provide the highest-quality workmanship possible with professionalism, promptness and honesty. We succeed at this because of the integrity of our subcontractors and staff, our commitment to a solid work ethic, and our passion for staying current with the newest innovations of our industry, with consideration for the environment. RENOVA CONTRACTORS is a general contracting business incorporated in Florida in 2016 by Eng. Abraham Benmergui. Our staff and crew bring years of experience to bear in residential and light commercial building and high-end renovations and additions. Currently, the company is involved in custom whole-house renovation and remodels.All of our services are safe because we are licensed and insured in the State of Florida. Typical projects are structured with one of the principals as the primary project manager. A working supervisor or foreman is on the job from start to finish and is responsible for the implementation of the design. We’ve worked with our subcontractors for years because our relationships are built on trust and performance. Our employees have been chosen based on their ability and level of craftsmanship, as well as their personal qualities and values. It would be an honor for us if you will allow us to work with you in some future ventures. BH Builders Assoc. LLC is a state licensed and fully insured construction company specializing in interior remodeling and new construction for both, commercial and residential buildings.We are a full service construction firm. Florida State licensed General Contractor, serving Miami Dade and Broward Counties. From residential to commercial projects, no job is too big or too small for Us. Welcome to Chiro's Paver Corp. Website. Since you have arrived at our website, chances are that you are considering improving your home, Chiro's has your solution. Whether you want to improve the look of your driveway, resurface your pool deck, or add a walkway to your yard, Chiro's CAN make your home a better place to live. We offer a full-line of pavers, stamped and smooth concrete, and waterfalls to compliment your outdoor environment. We have designed our website to help you find the right paver, color, style, and pattern that can achieve the design you are looking for. Just like other home improvement projects, there is a lot to consider. What does your property look like now? What would you like it to look like? What is your budget? These are all questions that we will help you answer. We invite you to browse our virtual website showroom, where we display our most popular product lines, including product specifications, our company history and past project information and photographs. Otherwise you may come visit us at our showroom located at 11893 SW Miller Drive in Miami, Florida or call us for more information at (305) 221-3456.